Ruff Wear's multi-day, high capacity adventure pack. I started backpacking young, hiking various environments from the green mountains of the Appalachians to the barren desert of Arizona. I enjoy the solitude of deep backcountry and prefer colder weather and snow. I’m moving toward becoming a light weight hiker, but am still safety conscious and want to be as prepared and comfortable as possible. My goal is to get my pack weight between 15 to 20 lbs (6 and 9 kg), but right now I'm hovering around 25 lbs (11 kg). Additional information about the author can be found at http://www.corridor9.net. The pack itself is designed in two main pieces. The Web Master harness acts like an external frame would on a human pack. It fits nice and tight to the dog's body with 5 points of adjustability. Included on the harness is a handle that allows the human handler to assist the dog over various obstacles, lots of padding and fleece on the straps, reflective accents to make visibility in low light easier for the handler, and a strong aluminum leash attachment. The saddlebag area of the pack is where all the gear is stowed. It features 2 large pockets, and two smaller pockets. The hydration bladders slip into a zippered compartment located inside each large compartment. The primary job of each smaller compartment is to hold the compression straps. These compression straps help to anchor the gear down so the load isn't constantly shifting. Both exterior compartments feature waterproof zippers and drain holes in case water does enter the pack. As with the Web Master harness, there is reflective trim in various places. 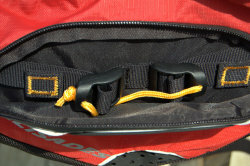 The saddlebags attach to the harness with 4 quick connect buckles. 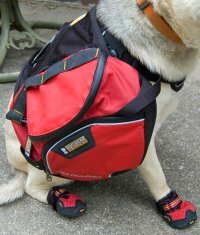 This allows the pack to be easily removed during rest breaks as while still keeping it tight and stable during the hike. 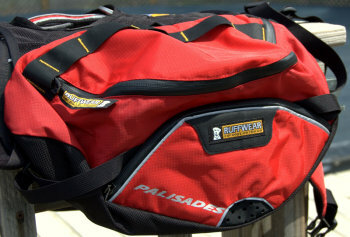 The Ruff Wear Palisades Pack arrived to my door in good condition with no missing parts. This pack seems to be very well constructed. All of the zippers are nice and tight and there are no hanging threads, weak seams, or holes. The straps on the Web Master are symmetrical, the padding is not pilling, and the buckles are all in good working order. Unfortunately, I received the wrong size. This is in no way Ruff Wear's fault as it was simply a miscommunication between BackpackGearTest staff and myself. When the original test call came out, we were slated to test the Palisades II pack. One would naturally assume that the Palisades II pack is the newer version, but this is not so. I ended up taking my measurements from the older Palisades II pack which led to the pack we received being too big for Sadie. I called Ruff Wear a couple of days after receiving the shipment to discuss an exchange. I spoke with a gentleman named Kyle who was very courteous, helpful, and quick to make sure I received the right size for Sadie. I received a new pack within 3 working days of my discussion with Kyle. It wasn't until I started taking pictures for this report that I realized how many features this pack really offers. Starting with the harness I noticed that it is designed to stay in place. This seems logical of course but I have to think about how many times I've tried on packs myself that seem to wiggle more than necessary. The five point harness is constructed to be adjustable in every way, making it that much easier to fit to Sadie. 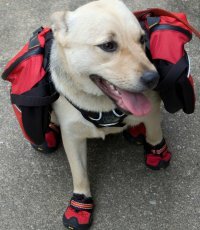 The front Y strap does not include padding, but both straps that hold tight to the belly include felt covered padding to make sure that the dog doesn't develop chafing or blisters on such a sensitive area over a long hike. The pack itself is quite large, a lot larger than I thought it would be. There is plenty of room to store all Sadie's food, water, toys, leash, and safety supplies. In all reality, it's so large that I have to be very conscious about over packing it and thus causing her to be tired and worn out. Due to the high susceptibility to hip dysplasia in German Shepherds, I really have to be careful how much weight I put on her back. Having too much weight on my back may be discomforting, but rarely does it turn physically debilitating as it may for dogs. This is something that any caring handler also needs to be concerned with. There are two compression straps associated with each side of the pack; one running to the front and one running to the back side of the pack. Both compression straps are connected to the buckles in the smaller side compartment. This allows the smaller compartment to hold all the excess strap material and keep them from snagging on limbs and brush along the hike. The buckles are attached back to back and have a yellow cord running between them. This yellow cord is key in allowing the compression straps to loosen at the same time. If the handler pulls on the yellow cord, instead of the individual buckles, both buckles loosen at the same time. Quite an ingenious solution in my opinion. The water bladders are no longer mylar squares that are heat sealed together like the older Palisades II. They are now very similar to the standard blue water bladder. There is a flexible hose approximately 1.5 ft (0.46 m) in length that attaches from the bottom of the bladder to a valve. The valve is not the typical bite valve, but is more of a drain valve that can be opened to allow water to free flow into a drinking container. There is a loop of cord sewn into the pack itself that holds the valve and tubing close to the zippered opening on the front of the pack. This keeps the handler from having to dig through the bladder compartment to find the valve every time the dog needs water. The fill opening is approximately 2 in (5 cm) wide with a screw on cap. I did find that it was a bit difficult to get the fill open this cap even with dry hands due to the seal being tight and the lack of a knurled grip on the cap itself. There are two daisy chains located on the top side of each large compartment. These are constructed from a rubberized material and sewn in such a way that there are five loops. In addition to the five gear loops, there is one smaller loop that is used as a hood for the zipper to slide under. This prevents water from entering the zipper pull section and dripping onto the pack contents. 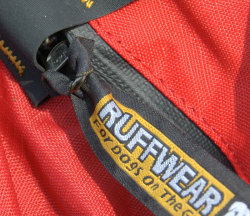 The zipper has a pull with the Ruff Wear logo on it making it easier to open when tucked under the daisy chain hood. I am a bit concerned about this pull though. Because the zippers are waterproof they are a bit difficult to get open. The zipper pull looks like it's made of this ribbon material or strap. It's attached to the zipper itself by slitting it down the middle and forming a Lark's head knot as seen in the picture above. While this may be a very useful knot for a piece of cord or rope, using it with a flat piece of material that has already been cut may lead to more ripping. I'll keep a close eye on this throughout the life of the test. So far, I am pleased with the quality and design of the Palisades pack. It looks like Ruff Wear really went the extra mile to make sure that the pack is comfortable, stable, and usable for a dog and the handler. 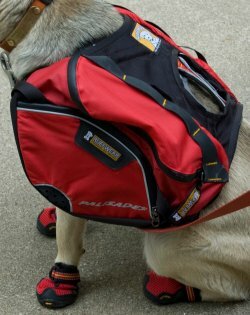 I have no problems with the pack or its design so far and am looking forward to many long hikes with Sadie and her new Palisades pack. I'd like to thank BackpackGearTest.org and Ruff Wear for allowing me the wonderful opportunity to test the Palisades Pack. During this testing period I was only able to use the Ruff Wear Palisades on two occasions. Both of these occasions were day trips to the Pennyrile State Resort Park area of the Pennyrile State Forrest, a 14,000 a (5600 ha) section of forest that has roughly 23 mi (37 km) of trails. The elevation for the area is between 400 -700 ft (122 - 213 m). Both hikes were on the Lake trail loop that is roughly 2 miles in length. Temperatures for these trips hovered around 75 F (24 C) and there was no precipitation on either trip. In addition to the trail outings, I have been using this on a majority of our walks around the block to get her more used to carrying her own gear. Testing this pack is a dream! While I haven't loaded the pack to the level I will when she's a bit older, it still holds the essentials and allows me quick and easy access to the items I need in a flash when hiking in the woods with Sadie. Having quick and easy access to her leash, food, and water make our trips all the more enjoyable. Keeping her dog slobbered stuff out of my pack also helps me keep my sanity throughout our treks. Having a harness that I can pick her up over obstacles that are too big for her is wonderful as well. Since she's a smaller dog, she can't jump as high as I can step, so this handle was a definite plus during our outings where high boulders cross the trail. The pack continues to fit wonderfully, and she has gotten used to donning and doffing it. Initial fitting did take a bit of time, probably 5-6 minutes. However, I took the pack off her each time I needed to adjust multiple straps so she didn't fidget constantly during the fitting. We now have it down to an art and in just a matter of seconds we can fit the pack. She's even learned that she needs to raise her paw to allow the chest strap to slide over it. It isn't the lesson in futility that I thought it would be and is actually rather easy now. The straps hold the pack exceptionally well and only allow a bit of slippage in the back end. However, to get the pack tight enough that it doesn't slide around any is definitely uncomfortable for Sadie as she rolls around on her back trying to get it off and limping from the pain in her back end. The straps are very well sewn and the plastic clips are tight enough to not allow slipping. They didn't need to be readjusted once since the initial fitting of the pack. I did need to remove the pack from the harness for the initial fitting, but only occasionally removed the pack to use just the harness by itself. As stated above, the pack seems to fit Sadie rather well and only slips around in the back end a bit. This slipping does allow the pack to self center after a few steps when she's bumped it against a tree or trail sign. So far, it hasn't thrown her off balance any that I could tell and she hasn't fallen down at all. It doesn't seem uncomfortable to her anymore now that she's gotten used to it, and I have not seen any blisters or fur rubbed away in spots that the straps are a bit tight. So far, I have not seen any stitching come loose on either the pack or the harness. Although it has only been scraped against the trees or posts a handful of times, it has seen a bit of ground scraping as Sadie likes to roll and slide along her back even with the pack on. None of the seams have loosened that I can tell, the ladder remains firmly attached to the pack, and the bladders remain intact. The leash points remain firmly attached to the harness. All zippers remain in good shape and haven't become stuck with mud. There have been no instances of zipper disease. As stated above, I haven't fully loaded her down for a week long trip yet. We're still dialing in the exact amount of weight that she should comfortably be carrying so that Sadie doesn't get overloaded and have hip problems. So far she's carried a couple of days of food and roughly 1L (.26 gal) of water split among the two provided water bladders. These water bladders work very well for allowing me to keep Sadie hydrated throughout our trip. While we still haven't gotten down the art of drinking straight from the tube, it is still easier to get her water from the packs bladders as opposed to my own. I have found that the internal compression strap holds the gear inside the pack from shifting around very well. While I can stick small items in the compression strap pocket, its main use is really just to hold the compression straps and any excess that may be there when the compression straps are held tight. I figured that these pockets may be useful to carry other small items, but with the size of the other pockets, I didn't really need to use these at this time. Maybe these pockets will be more useful later when she has the ability to carry more stuff. I have not had the need to wash the pack yet as it has not become dirty. I will probably was this during the long term period just to see if any of the seams or water resistant abilities are affected. This concludes the Field Report phase of this report. Be sure to check back in roughly two months for information from the Long Term Report phase.